What’s this series all about? And what’s so GREAT about the nephew and the aunt? Well, this series is about illustration! This series is about poetry! And the GREATness? Well, Landon’s mom is my niece so that makes him my GREAT nephew. And since he is a GREAT nephew, that makes me a GREAT aunt! Right? Oh! You had the family tree thing figured out, did you? Well, the other GREAT thing is that we have teamed up to bring readers a-picture-with-a-poem sort of thing. I am going to feature some of my poems that Landon has illustrated. See how GREAT that is??? You know what else? Landon is a fifth grader. Ten years old, mind you. No kidding! And majorly talented! I have a feeling that every time you visit our series and see his illustrations that you’re going to say, “Wow! That’s GREAT!” That’s what I said when Landon said he wanted to do this. I hope that you enjoyed Episode 1 and will return every other Friday for future episodes. I would love for you to follow my blog so that you don’t miss anything. 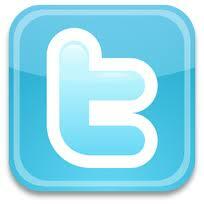 You can follow in a reader or by email. Options for following are on the right hand side. Landon and I both love comments. 🙂 Remember, though, that Landon is a fifth grader and takes his responsibilities as a student very seriously and most likely won’t be able to respond to each comment. Laura Shovan is hosting Poetry Friday today at Authors Amok. This entry was posted in A Great Nephew & A Great Aunt, Poems and tagged A GREAT Nephew & A GREAT Aunt, Landon, Poems, poetry, Poetry Friday. Bookmark the permalink. Penny, this is the first time that I have visited your blog site and I am delighted that I caught your post on Poetry Friday. I think the idea of family combination writing/illustrating teams is a great one. Multi-generational literacy duos provide high energy and fun. Kudos to you and Landon. You know, Penny…you are so amazingly gifted at rhyming…and Landon is an incredible illustrator..you guys make a great team! Thanks, Vivian! We certainly are enjoying our collaboration. I loved your poem and Landon’s artwork! What a great idea for a blog! He might be illustrating your books if this partnership keeps up. Have you considered having him draw pictures to inspire you on occasion and you writing a poem about his illustration, rather than vice versa? I look forward to your next post! I have considered that, Rebecca. That might be a fun change-up for future posts! We look forward to having you back for episodes to come. I like this new series! How fun to include your GREAT nephew! Awesome illustration, Landon, and fun poem, Penny! Thanks for sharing! Yes, Erik. Landon was on your Creative Kids series in March of 2013 with his Buried In a Book poem and illustration. Obviously, he’s still at it! Thank you for joining us as we kick off our new series. This is AMAZING! I can’t wait for the next installment. Talented aunt, talented great nephew! Thank you for coming by, Julie. This all came about because I had been thinking about adding something different to my blog that had to do with poetry, because I love poetry. But words are so fun with an illustrator’s vision. I CAN’T illustrate. Voila! I thought of Landon. Please do stop by for the next episode in 2 weeks! What a fun start to a fabulous new series! (Love the banner!) I definitely see a book in your future. My 11 year old daughter Miranda is creative in the same way you are, Landon. It’s a wonderful gift and I’m glad you’re teaming up with your Ant… er, Aunt Penny to keep it fresh and fun! Maybe we will see some of Miranda’s creativity over at your blog, Michelle 🙂 I sure do enjoy your Little Ditty series. I see you have Irene Latham featured. I have that saved in my Inbox because I don’t want to miss it. Her new book sounds amazing! I read some of her poems on Jama Rattigan’s blog and it will be fun to hear more about Dear Wandering Wildebeest on your post. Thanks so much for your kind words and please visit for future episodes. Thanks for your nice words about my blog, Penny. Miranda’s artwork does appear occasionally. I’m not sure she’s ready for a regular commitment to the blog, but sometimes I just throw something at her and it sticks. Here are a couple examples: http://michellehbarnes.blogspot.com/2013/08/limerick-alley-elizabeth-steinglass.html and http://michellehbarnes.blogspot.com/2014/04/haiku-garden-tabatha-yeatts.html . The DMC star emblem is hers as well. Hi, Joanna! Nice to see you. You had a busy summer. Thanks for stopping by to check out our new series. I’ll see you around the blogosphere. This is GREAT, Penny, and Landon! I love the details in Landon’s picture – the scarf and the moose’s swirly eyes – they really give us a sense of the setting and the moose’s state of mind. I think you’re going to have so much fun with this. I’ve had my 4th grade son illustrate a few things on my blog, too, and it is a blast to see what he comes up with. It is going to be fun, Carrie. I love the details, too. The ants in the header are amazing…down to the cups of coffee steaming in the background. 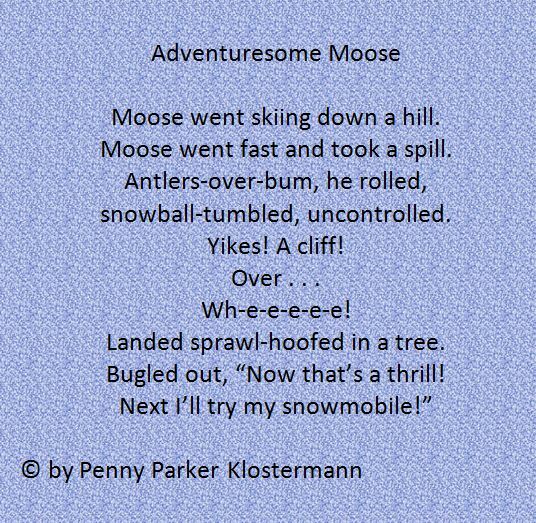 The moose’s eyes are perfect, as are his hooves in the air as he imagines his adventure on the snowmobile! All fun. Thanks for visiting. I don’t like this feature, Penny. I LOVE IT! You had me at the mini-header. So much fun! I have a new goal in my life – to write like you and draw like Landon! Hi Genevieve and Cupcake! So glad you came by! The header is the first thing I saw, Genevieve, and I was just like you…hooked! Hope to see you for in a couple of weeks for Episode 2. Loved this, Penny! Can’t wait for the next one! Landon is one talented 5th grader and you, and excellent rhymer! 🙂 This will be a fun short way to break down meter every other week and learn how to master the very challenging task of writing poetry. Penny, it’s all been said! This IS GREAT! What a fun idea!!! Thanks, Karen! So glad you stopped in for the debut episode! Hope your year has gotten off to a good start. What a brilliant idea, Penny! Love the banner. Maybe this series should read Talented great Nephew and Talented great Aunt. LOL Looking forward to more posts. This is… oh, I have to say it, even though others have said it before me… GREAT! Love the poem, the artwork, the BANNER, the whole idea! Yay you two! I’m so glad you said it, Beth! In fact, it’s GREAT that you said it (hee hee)! Thanks for stopping by to join us for Episode 1! The banner is so terrific! I love the ant driving the bulldozer! Thank you so much for visiting, Tabatha. Great! Yes Great! Great poem! Great illustration! Great sister! Great grandson! That moose is hilarious. Can’t wait till episode II. Hi (another) Sis! Thanks for coming by. I can’t wait until the next episode either! Great fun! What a fun project! I love both the poem and the illustration! Landon is quite the artist!! He is quite the artist, Mary Lee! I was thrilled when he agreed to illustrate for the new series! And, you know what else? He is a good poet, too! A natural. Pretty gifted all the way around. Thanks, Myra. I’m so glad you enjoyed it! I am really having fun with it and so is Landon. His illustrations do tell a story, don’t they? Love the humor expressed in both words and illustrations! Looking forward to more. What a GREAT, GREAT idea! The two of you make GREAT music together! Thanks for sharing the fun! Absolutely charming. I love the moose’s expression. Thanks for sharing this. Yes! The eyes are definitely the eyes of a cliff-diving moose! Thank you for visiting. Great project, Penny and Landon. Landon — you are a fabulous illustrator. I especially liked the construction machines that you drew for the series nameplate. Penny, poor moose. Those snowmobiles looked like so much fun, too. Don’t you love the ants, Laura? I still laugh when I look at that illustration. What a great interpretation of our series name! Thanks for stopping by and thanks for hosting Poetry Friday today. Wow….so much talent in the family, I am just the sister of Penny and the GREAT aunt of Landon, and wishing I had Moose more talent!! I am head over heels for them…..
Hi, sis! Thanks for tuning in for Episode 1! Glad we sent you head-over-heels! I really love this and love those moose eyes Landon! Awesome art and poem. That is one crazy moose, huh? Thanks for joining us for Episode 1, Stacy. He sure might be some day, and, Hey! I know an awesome agent *wink*!!! He’s really GREAT, isn’t he??? I didn’t just say, “Wow! That’s GREAT!” I said, “WOW! THAT’S GREAT!” And, “WHAT A GREAT IDEA!” The only thing missing ids the sound bite – I bet you can squeak out a great elk bugle, Penny! Oh my! I don’t sound very moose-like! The neighbors will probably call animal control if I keep practicing! I’m going to have to leave the bugling to Moose! Thanks, Julie! It’s GREAT that you like our new series! I don’t even know if moose say much, but I figured you may have attended the bugling contest in Estes. Hee! Hee! I haven’t done that yet. But I did watch a video on the Internet of a moose bugling…just A little research on my poem. You guys are off to a GREAT start! I love the idea behind this blog and look forward to more awesome companion pieces! Jeanne, I can already tell that I’m going to have a lot of fun with this series! So glad you enjoyed it and we’ll look forward to seeing you for Episode 2! That’s one talented and great nephew!! Congratulations Landon on your illustration. And what a fun poem, Penny–I love your moosey images–antlers-over bum and sprawl hoofed. Wonderful! Thanks, Buffy! The thought of a moose skiing conjured up some pretty moosey word pictures! And then Landon carried it out in such a fun way that it exceeded my expectations! Thanks for visiting! Penny and Landon – I love that you’re working together on this!! Penny – your poem is fantastic (with a little fleshing out, you’ve got a picture book here)! I especially love “antlers-over-bum”!! Landon – you are so talented! I can’t believe you’re a 5th grader!!! Love it, Penny. What A GREAT poem and GREAT execution. GREAT work, Landon and Penny. ConGREATulations to you both. Thanks, Teresa. It will be wonderful to have you back for the upcoming episodes! Thanks for coming by! Isn’t that moose hilarious, Robin??? 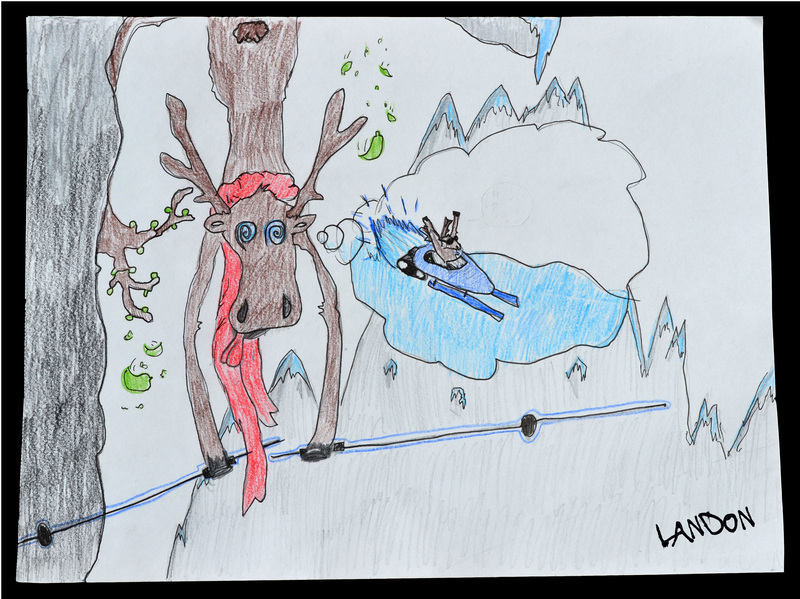 And the moose on the snowmobile with his hooves raised….cracked me up when Landon’s mom emailed me his drawing! Thanks for coming by! Love Landon’s moose! So much character and action going on. Your poem rocks as always, Penny. Love ‘sprawl hoofed’. Doesn’t Moose have character??? No telling what will happen on that snowmobile! Thanks for joining us for Episode 1, Catherine! Love, Love, LOVE! My daughter and I did a similar thing for a post last summer and it was so much fun! The only twist was she did the picture first and then I used it as a prompt for my poem. I have – for a long time- been fan of Penny’s poems and I’m already a fan of Landon’s illustrations. This is GREAT idea all around and I look forward to your next poem/picture post! Thank you, Laura! I had been trying to think of something different for my blog. I love doing Perfect Picture Book Friday but I wanted another regular post. So I thought of bringing Landon in and he agreed! Now I will alternate between PPBF and this series that will connect to Poetry Friday. I know Landon will have a lot of new fans! He’s super creative! Oh my gosh, Penny this is so much fun! Love your poem and how Landon illustrated it! What a wonderful way for you both to connect and share your creativity! Thank you Kim! I love his illustrations, too. The series banner is just awesome and a great surprise when I saw it! I had no idea he would have ants building it! So creative. Funny things is…he is extremely allergic to fire ants and so he hates them! Hates ants, period! So I imagine it was kind of fun for him to rain on their parade!! !